FHA Loans are the most popular mortgage loan programs today due to the many benefits it offers. There are thousands of mortgage loan applicants with great credit scores but due to the strict mortgage lending guidelines on conventional loans set by Fannie Mae and Freddie Mac cannot qualify for a residential mortgage loan. Some of the hurdles conventional loan applicants face are high debt to income ratios, prior bad credit, prior bankruptcies, prior foreclosures, needing non-occupant co-borrowers, and unsatisfied collection accounts. FHA loan programs offers lenient mortgage underwriting guidelines, 3.5% minimum down payment, low mortgage rates, generous sellers concessions ( FHA allows up to 6% in sellers concessions whereas conventional loans cap sellers concession credits to 3% ), and short waiting periods after a prior bankruptcy and/or short sale. FHA mortgage rates on 30 year fixed rate FHA Loans are much lower than 30 year fixed rate conventional mortgage loans offered by Freddie Mac and/or Fannie Mae. FHA Loans are not for every home buyer or homeowners who are needing refinance mortgage loans with good credit. Mortgage loan applicants with great credit may get better loan terms and programs with a FHA insured mortgage loan. The United States Department of Housing and Urban Development created the Federal Housing Administration back in 1934 with the goal of making and promoting homeownership possible to all hard working Americans in a down housing market after the Great Depression. The main mission of the newly created Federal Housing Administration was to make the dream of homeownership possible with the smallest amount of down payment. The minimum down payment required for a potential home buyer is 3.5% of the home’s purchase price. There are two other mortgage loan programs that do not require a down payment, which are VA Loans and USDA Loans. With VA Loans, you need to be a Veteran of the United States Armed Services and need a Certificate of Eligibility. With USDA Loans, there are restrictions with regards that the mortgage loan applicant cannot have debt to income ratios exceeding 28% front end debt to income ratios and the back end debt to income ratios cannot exceed 41%. USDA Loans also have income requirements where the mortgage loan applicant for a USDA Loan is capped on the maximum household income they can make in order to qualify. The income requirement varies depending on the state and county the property is located and the amount of dependents the mortgage loan borrower has on their tax returns. The spouse’s income who is not on the USDA mortgage loan will be taken into account with USDA mortgage loan program. Many of those who are eligible for VA Loans and USDA Loans turn to FHA Loans due to the more lenient mortgage lending standards. FHA does not fund mortgage loans. FHA only insures residential owner occupant mortgage loans to private mortgage lenders who are FHA approved. The Federal Housing Administration guarantees mortgage lenders against default from mortgage loan borrowers who have defaulted on their mortgage loans. FHA has insured more than 34 million residential mortgage loans for mortgage lenders in the United States since 1934 and is still going strong and making homeownership possible to all working Americans and offers second chances for potential homeowners who have had prior financial hardship such as bankruptcies, foreclosures, deed in lieu of foreclosures, and short sales. Approved FHA mortgage lenders need to follow FHA’s mortgage lending guidelines in order for their mortgage loans to be insured against default. As discussed earlier, a home buyer can secure a FHA loan with a 3.5% down payment. There are disadvantages with FHA loan programs besides the many benefits FHA loan program offers. FHA charges an upfront mortgage insurance premium for all FHA Loan Programs of 1.75% of the mortgage loan amount. The upfront mortgage insurance premium is normally rolled into the mortgage balance and the home buyer does not need to come up with this money. For example, if the mortgage loan amount is $100,000, FHA will add 1.75% or $1,750.00 to the $100,000.00 mortgage loan balance so the total mortgage balance will be $101,750.00 instead of the $100,000.00. FHA also will require FHA mortgage insurance premium on the principal FHA mortgage loan balance for the life of a 30 year fixed rate FHA mortgage loan which cannot be cancelled no matter how low the loan to value is. The annual mortgage insurance premium on a FHA insured mortgage loan is 1.35% of the FHA mortgage loan balance which is divided by 12 monthly payments and is escrowed by the mortgage lender and is paid monthly along with the principal, interest, taxes, and homeowners insurance. Annual mortgage insurance premium on FHA loans gets reduced to 0.45% of the FHA mortgage loan balance for 15 year fixed rate FHA loans if the FHA mortgage loan borrower can put 10% down payment. 15 year fixed rate FHA mortgage loan borrowers can cancel their FHA annual mortgage insurance premium after 11 years if their loan to value is at 78% LTV or lower. FHA insured mortgage loans are assumable and this feature is a great benefit for those FHA mortgage loan borrowers who secured a 3.25% FHA rate in early 2013. Today’s FHA insured mortgage rates are at 4.25%. As mortgage rates rise, this is a great selling feature to potential home buyers. FHA mortgage rates are not credit score sensitive like conventional mortgage loans. You will get the same FHA mortgage rate no matter how high or low your credit scores are and no matter how much down payment you put down, whether it is 3.5% down payment or 20% down payment. For conventional mortgage loan programs, that is not the case. With conventional loans, the lower your down payment is, the higher your mortgage rates will be due to the added risk factor to the conventional mortgage lender. With conventional mortgage loan programs, the lower your credit scores are, the higher your mortgage rates are. For example, for a conventional mortgage loan borrower with a 740 FICO credit score and a 25% down payment, the conventional mortgage rate may be 4.125%. However, if the conventional mortgage loan borrower has only a 5% down payment and a credit score of 620 FICO, the conventional mortgage rates will most likely be 5.625% plus the borrower may need to pay points. For those seeking a conventional mortgage loan in the near future, they really need to start looking at their credit scores and see ways of maximizing their credit scores. One of the biggest benefits with FHA loans are those home buyers who are planning on purchasing a multi unit 2 to 4 unit building. Any properties up to 4 units is considered a residential home and for those who will be an owner occupant in a 2 to 4 unit property can take the huge advantage FHA loans has to offer. FHA allows only a 3.5% down payment on a 2 to 4 unit property purchase as long as the home buyer will be living in one of the units for at least 12 months. With conventional loans, the minimum down payment required on a 2 to 4 unit owner occupant property is a minimum of 15% down payment. If the multi unit property plays their cards right, they can have their mortgage payments paid for by tenants from the rental income. With regards of potential rental income, FHA will allow 85% of the potential rental income to be calculated in the borrower’s debt to income calculations and no landlord experience is required. With conventional mortgage loan programs, only 75% of the potential rental income is allowed by Fannie Mae and/or Freddie Mac. Many conventional mortgage lenders will have their own mortgage lender overlays where they will require 2 year landlord experience from the borrower in order to count potential rental income in the borrower’s debt to income calculations. Another major benefits with FHA insured mortgage loan programs is that FHA’s mortgage rates will not be higher on 2 to 4 unit mortgage loans. Whether you are purchasing a one unit or 4 unit building, your FHA loan will not have a mortgage rate adjustment. With conventional loans, the more units the building has, the higher your mortgage rate will be plus reserves may be required. Reserve requirement are monthly principal, interest, taxes, and homeowners insurance payments and the conventional mortgage lender may require between 3 to 6 months of reserves. FHA allows for home buyers who have high debt to income ratios due to little or no income to have non-occupant co-borrowers to qualify for the mortgage loan. Non-occupant co-borrowers need to be family members. Non-occupant co-borrowers are on the mortgage note but not on title. FHA also allows for the home buyer to get 100% gift funds from family members for the down payment. 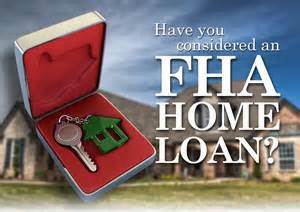 FHA also offers the FHA 203k loan program which is an aquisition and construction loan, all in one shot. A home buyer can purchase a home that needs either minor or major repairs and FHA will fund both the aquisition loan and construction loan. The after repair value appraisal will be used the mortgage loan borrower needs to pony up the 3.5% down payment of the after repair value appraisal. There are two types of the 203K loan mortgage programs. There is the 203k loan streamline loan which the maximum construction loan limit is $35,000. With the 203k Streamline loan, the homeowner cannot do any structural changes. They can do window replacement, roofing, plumbing, kitchens, bathrooms, basement, plumbing, electrical, HVAC, and other non structural repairs. They cannot do room additions or add luxury features such as outdoor kitchens or swimming pools. With the full 203k renovation mortgage loans, there is no dollar cap and the homeowner can do basically everything except pools, and luxury ammenities such as installing outdoor kitchens, or basketball courts, or tennis courts. Room additions are allowed and structural changes are allowed but permits are required and the general contractor needs to have an arms length relationship with the homeowner. For first time home buyers or seasoned home buyers who had a prior bankruptcy, foreclosure, deed in lieu of foreclosure, or short sale, there are mandatory waiting requirements for both FHA loan programs and other mortgage loan programs. The traditional waiting period after a bankruptcy is that the mortgage loan applicant has a mandatory 2 year waiting period after the discharge date of a bankruptcy. There is a three year waiting period for home buyers who had a foreclosure and/or deed in lieu of foreclosure from the date of the sheriff’s sale or the date the deed of the home was transferred out of the homeowners name into the name of the mortgage lender. There is a three year waiting period for those who had a prior short sale and the three year clock starts from the date that the sale occured per the HUD’s settlement statement. Back in August 15, 2013, the United States Department of Housing and Urban Development, HUD, which is the mother of the Federal Housing Administration, has launched the FHA BACK TO WORK EXTENUATING CIRCUMSTANCES DUE TO AN ECONOMIC EVENT which waives the traditional waiting period of 2 years for a prior bankruptcy and the mandatory 3 year waiting period after a foreclosure, deed in lieu of foreclosure, and short sale. The FHA BACK TO WORK EXTENUATING CIRCUMSTANCES DUE TO AN ECONOMIC EVENT shortens the waiting period to one year after a bankruptcy, foreclosure, deed in lieu of foreclosure, and short sale. However, there are strict mortgage lending guidelines to qualify. The home buyer needs to have been either terminated from their prior employer or the employer needed to have been shut down and/or went out of business. Voluntary resignation or quitting their jobs due to rumors of potential layoffs does not count. The mortgage loan borrower needs to provide proof that they were out of work due to involuntary termination and due to this termination and the loss of at least 20% of their household income, they had no choice but to either file bankruptcy or had to foreclose on their home. They need to have been out of work for a minimum of six months in order to qualify. The FHA BACK TO WORK EXTENUATING CIRCUMSTANCES DUE TO AN ECONOMIC EVENT mortgage loan applicant needs to have had great credit and a timely payment history prior to their loss of job and when the economic event happened, their credit scores have plunged. The applicant needs to have re-established credit and no late payment history after they have obtained a new job and currently be employed full time with a solid outlook that they will remain employed for the next three years. The FHA BACK TO WORK EXTENUATING CIRCUMSTANCES DUE TO AN ECONOMIC EVENT mortgage loan applicant needs to have a certificate of completion signed and dated by a HUD approved housing counselor and need to wait 30 days from the date of the completion certificate in order to formally apply for the FHA BACK TO WORK mortgage loan. All FHA BACK TO WORK EXTENUATING CIRCUMSTANCES DUE TO AN ECONOMIC EVENT mortgage loans are all manual underwrites and compensating factors will greatly improve the chances of a mortgage applicant’s approval. If you are a home buyer in the state of Illinois, Florida, California, Washington, Indiana, or Wisconsin and are interested in the FHA BACK TO WORK EXTENUATING CIRCUMSTANCES DUE TO AN ECONOMIC EVENT mortgage loan program, please contact me at 262-716-8151 or visit me at www.gustancho.com.